Egypt's criminal court sentenced on Wednesday activist Ahmed Douma to 15 years in prison in addition to a fine of EGP 6 million in a retrial on violence charges dating back to 2011. Douma and 268 other defendants were accused of possessing bladed weapons and Molotov cocktails, assaulting personnel from the armed forces and the police, torching the Scientific Complex in downtown Cairo and damaging other government buildings, including that of the cabinet and the parliament, during the 2011 uprising. The Wednesday court decision can still be appealed. 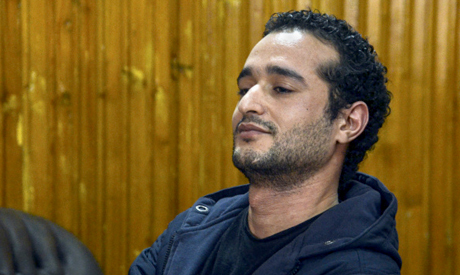 Douma was originally sentenced to life in prison and fined EGP 17 million by a Cairo criminal court in February 2015 after being convicted of the charges. Douma has also received three-year sentences in two other cases. The first sentence, which has already been served, was for breaking the country's protest law in January 2015, and the second was for insulting the judiciary in 2014. In the second case, his appeal was accepted and the conviction was overturned. Douma has been a long-time rights activist who protested against the regime of toppled president Hosni Mubarak, the military council in 2011-2012, as well as ousted Islamist president Mohamed Morsi.